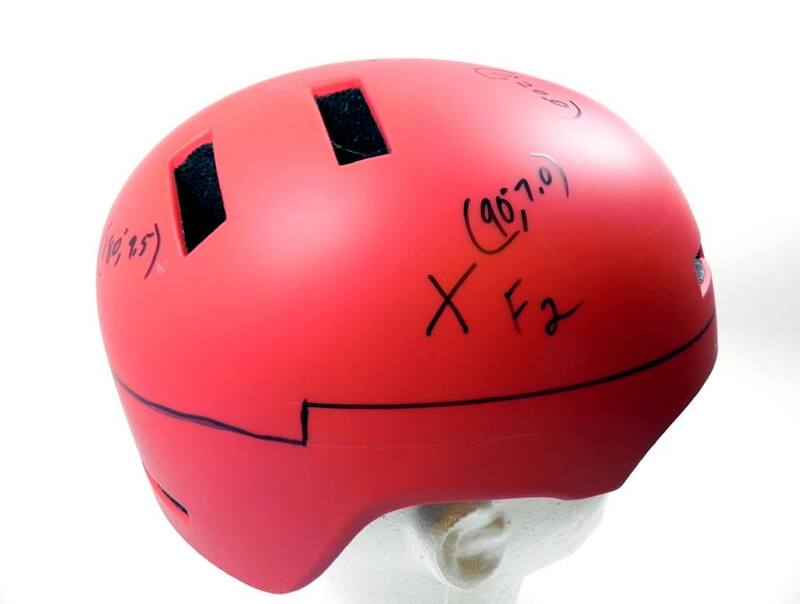 Summary: More detail on our testing of helmets for damage from sunscreens, insect repellant, shampoos and more. Here is the main page for the report. 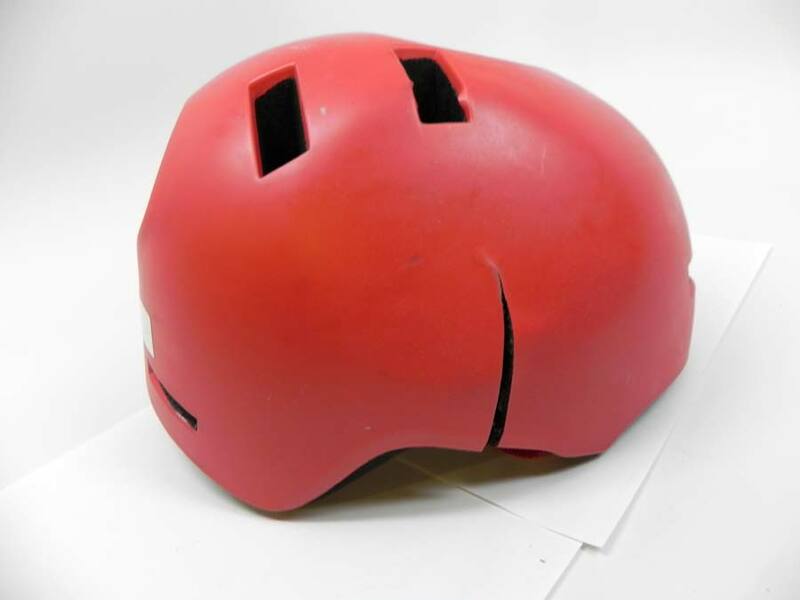 Note that despite evident surface damage, all of the helmets performed as well as a new one. 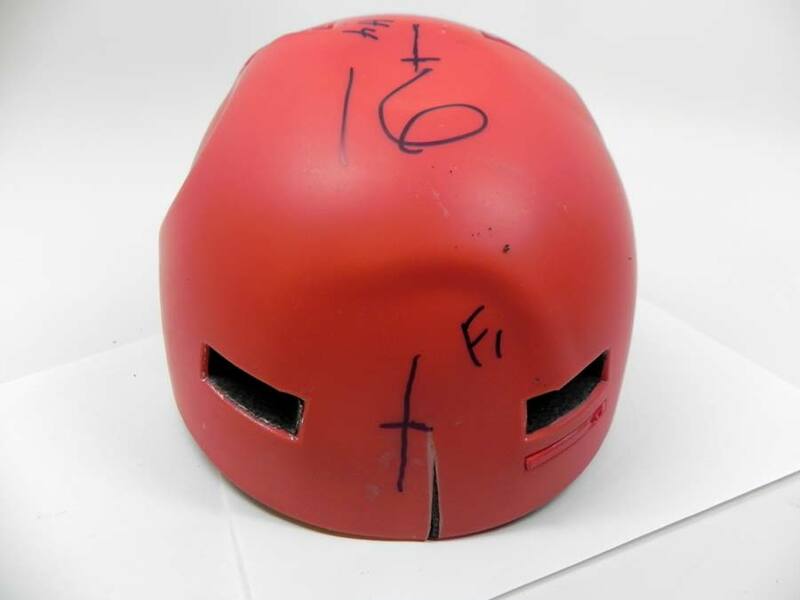 Here is a helmet marked with the test locations used on every tested sample. 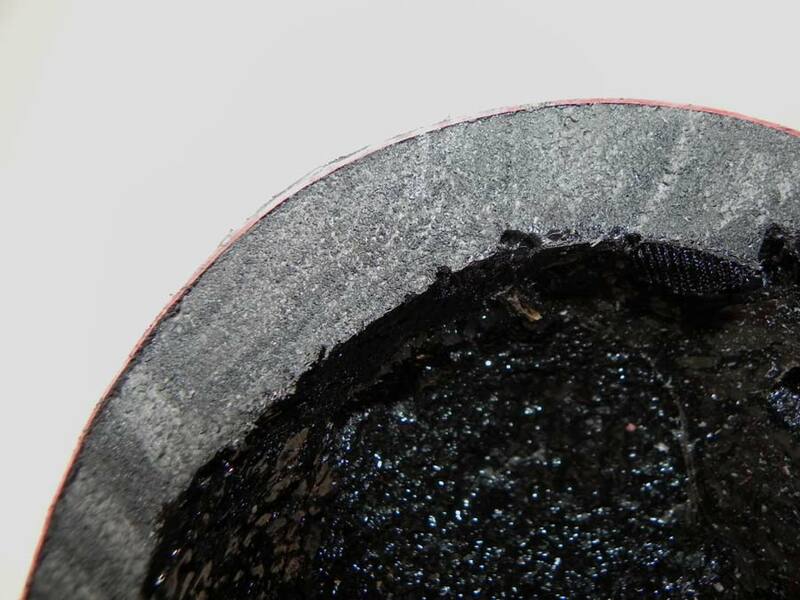 Splits and cracks are expected, and did not make a difference in energy management performance. 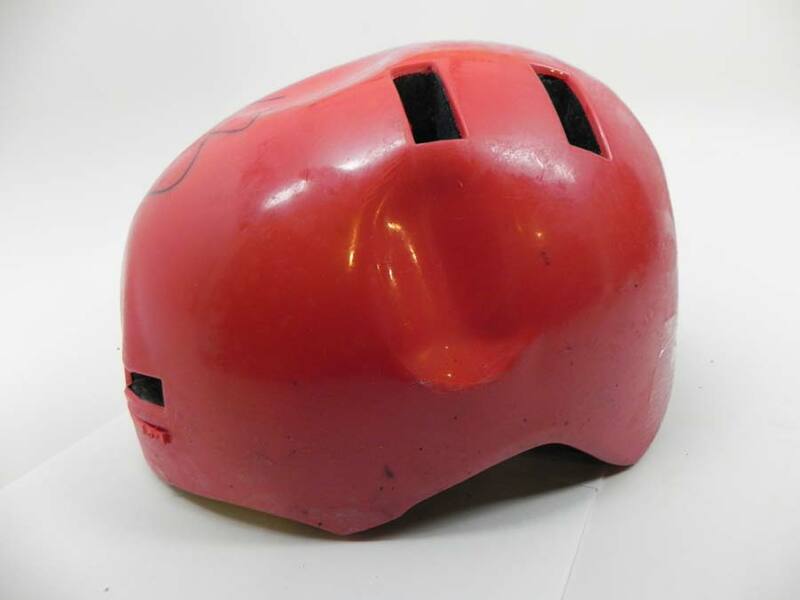 This is the helmet dosed with gasoline, a known destroyer of EPS foam. If this one had not been damaged we would have known that the test protocol was flawed. 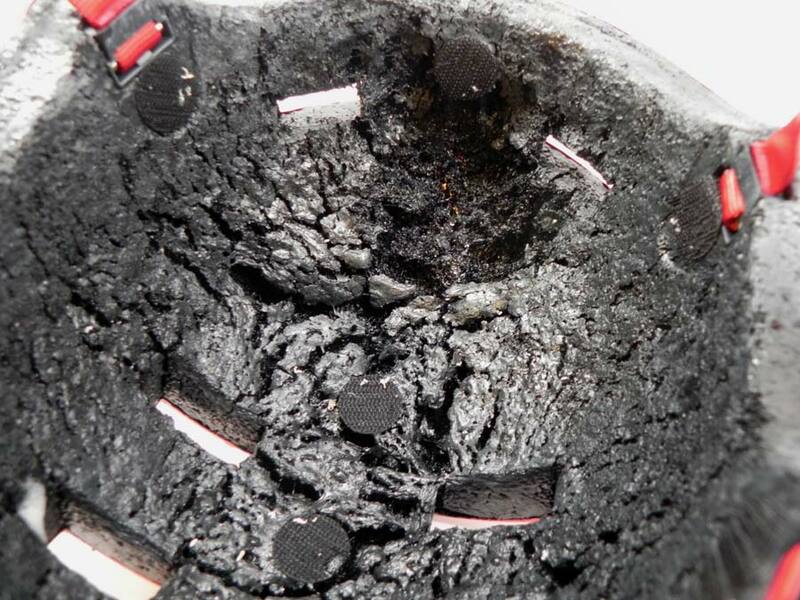 Here is a helmet with surface damaged by Backwoods Off with DEET. After testing, we cut this one in half. 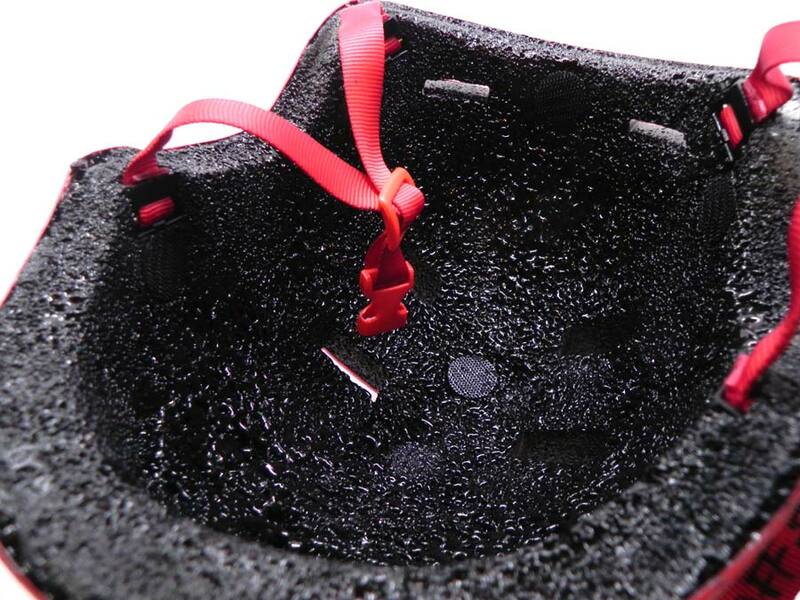 Note that the surface damage does not extend very deeply into the foam liner. 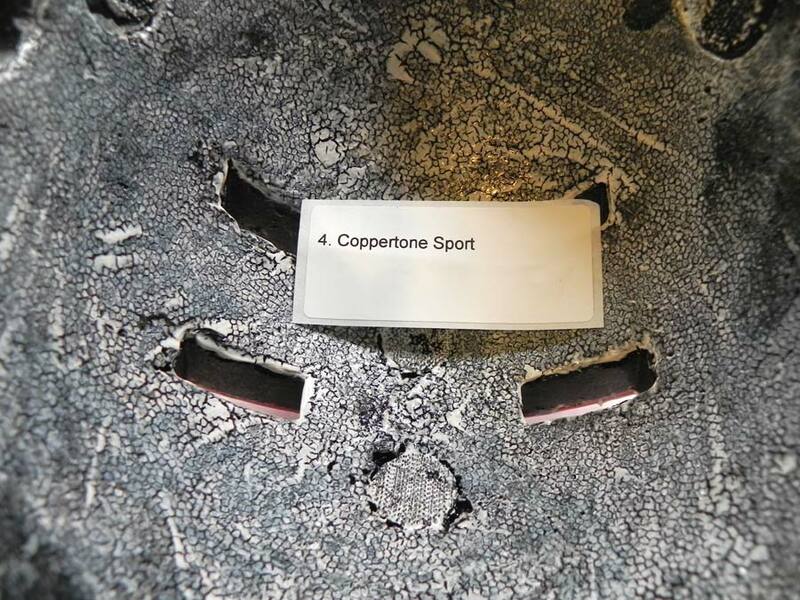 Here is the interior of the Coppertone helmet. 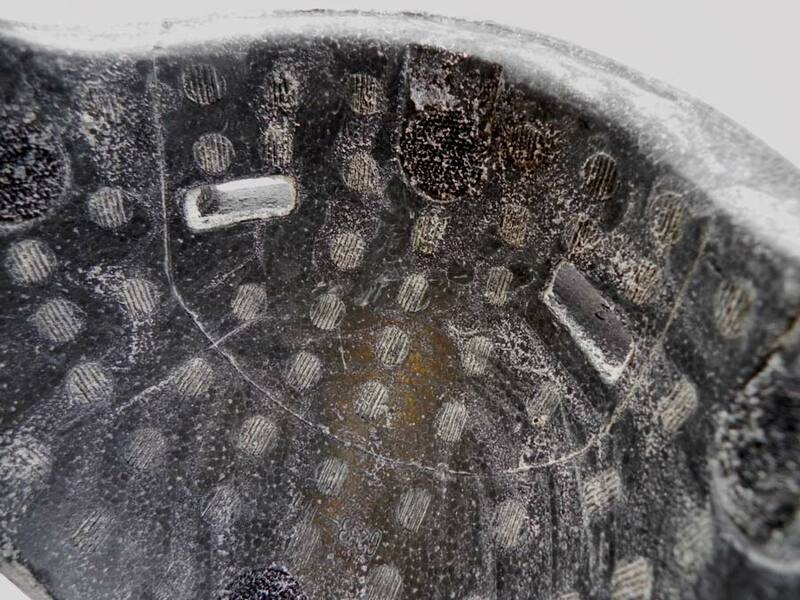 The surface of the liner was soft and gooey. Rogaine left a white film on our samples. It mostly washed off the ones using Women's Rogaine and the Rite Aid version with similar ingredients. But it stuck on the sample dosed with men's Rogaine foam. 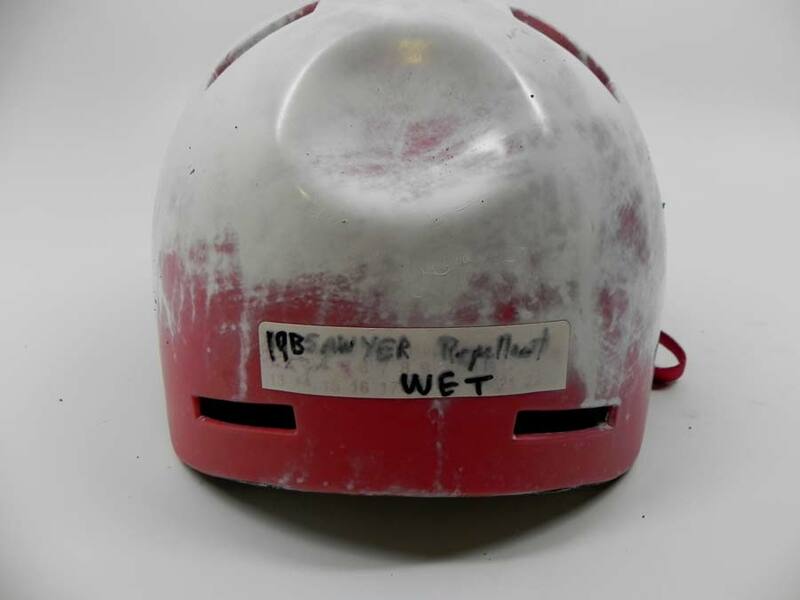 The helmet dosed generously 16 times with Sawyer's Insect Repellant looked normal when sent to the lab, but when submerged in water it developed this white film. 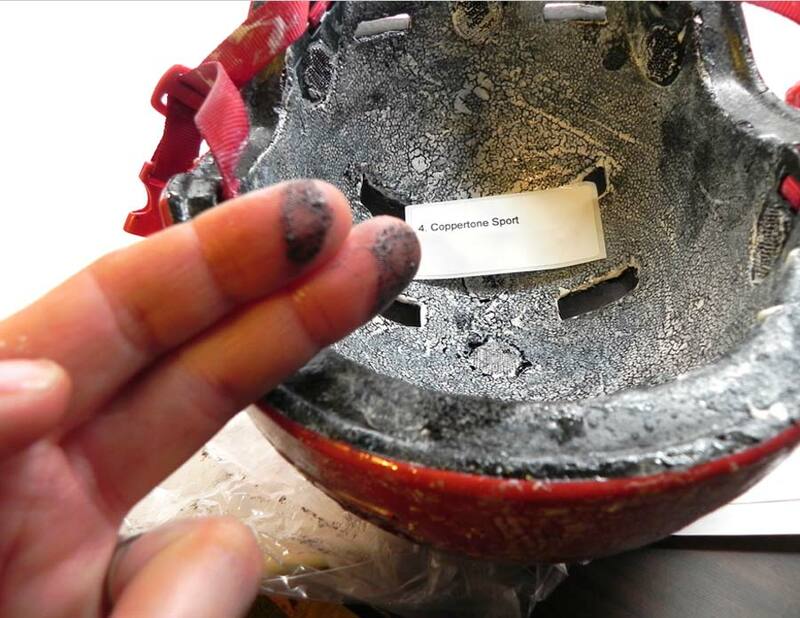 As with all the other helmets, there was no change in impact performance. 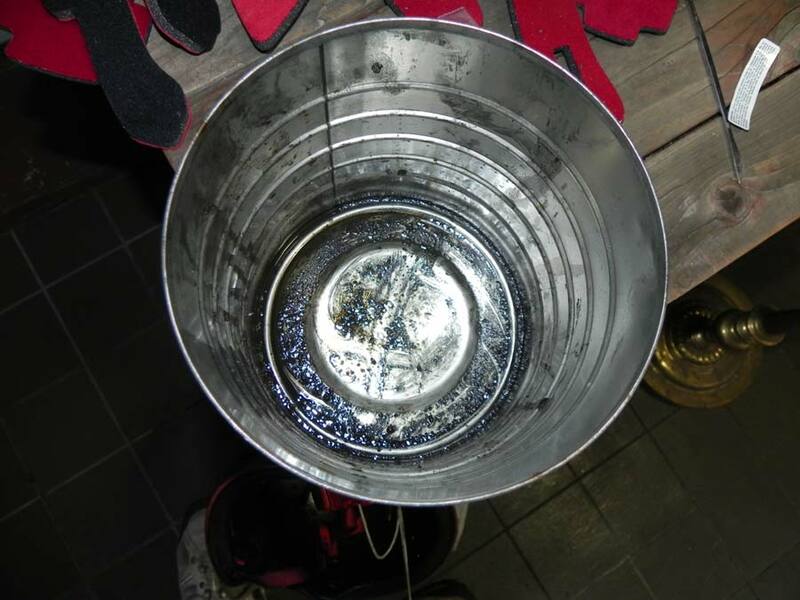 Our chain grease came from an actual bicycle chain. It had been applied as Mobil 1, a synthetic motor oil. After enough riding, it had acquired the dirt and black color. Here is the main report. Here are the actual test numbers from the test lab.